Membrane wall bending machine for MARTIN Caldeiras. 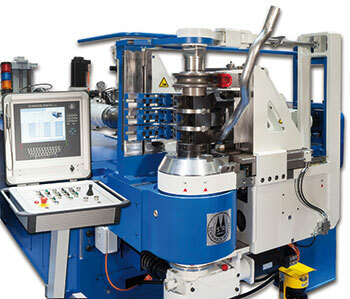 Tube and pipe bending solutions for the offshore industry "Made in Germany"
The tube bending machine manufacturer Schwarze-Robitec has opened its own subsidiary in North America. Since 1 April 2015, Schwarze-Robitec America Inc. has been implementing the entire sales and service for the high-quality Tube Cold Bending Machines Made in Germany. Regular customers and new customers from the USA, Canada and Mexico benefit from the customer-specific on-site advice, shorter delivery times for spare parts and attractive conditions. Schwarze-Robitec America Inc. sells Tube Cold Bending Machines ranging from 1/8” to 16” as well as bending tools and application-specific machine equipment. In addition to this, the team of experts implements spare parts procurement, machine maintenance as well as inspections and advises users with regard to modifications, major overhauls of existing machines and optimization of bending processes. Worldwide, Schwarze-Robitec GmbH has already sold more than 2,400 machines, many of them have been in unrestricted production runs for more than 35 years.